The farm and garden offer treats from nature. All our produce is grown without chemicals. 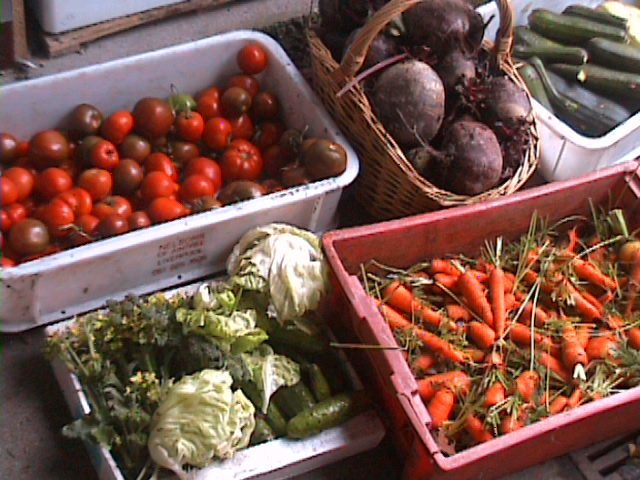 Vegetables are available in season, so please ask. Our hay is top quality. It is excellent feed for horses as it is grown without chemicals and swards are of mixed grasses to provide a more wholesome feed to the equines. Prices start at € 2.00 for small square bales (subject to season and availability). Round bales may be ordered prior to harvest at good prices. Grazing is available for horses in open pasture. We welcome well behaved horses to join the herd, avoid over grazing. Summer grazing is available at € 40 per horse per month. Tymandra is a natural horse person who has ridden for as long as we remember. She has worked in Jim Bolger's internationally renown training yard, veterinary practices in Ireland and the UK and has trained young horses. She has a growing knowledge of natural equine care methods and is studying science with focus on zoology. If you would like training or special care, please contact her to discuss your needs.